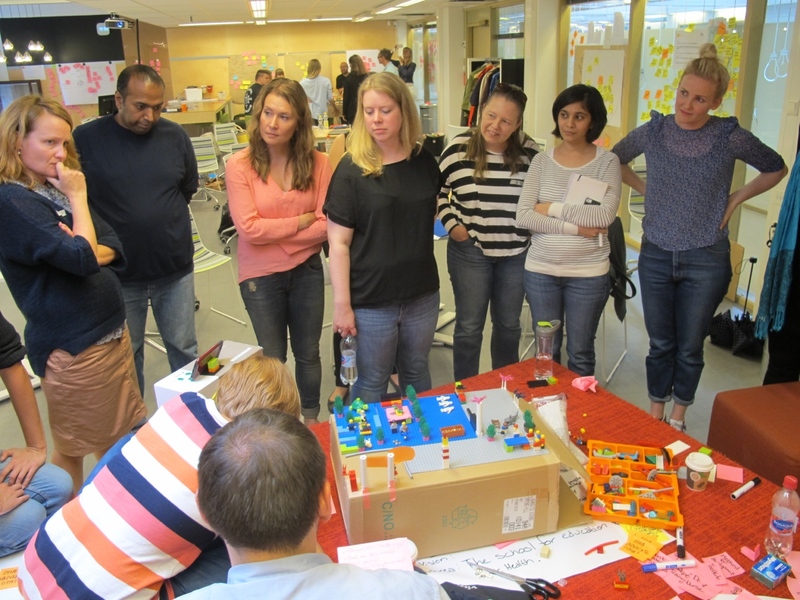 We kicked-off the SID program on 4.9.2015 with a course called Design Thinking, run by 2 wonderful personalities: Katja Tschimmel and Mariana Valença. The day started with a mind-shake warm-up, to shake up one’s attitude rather than neurons! The 2-day course (I ended up wishing it was longer) started with an introduction to the evolution concept of Design Thinking (DT). The take-away from this was that DT as a concept goes beyond its boundaries into areas such as Business Innovation. We learnt that although innovation brings certain challenges, through the application of key DT principles, researchers can addresses various difficulties and build stronger, more compelling consumer solutions.​ Katja also introduced the visual models which demonstrated DT at work: IDEO’s 3I model, the Hasso-Plattner Institute of Design at Stanford and Postdam models, Evolution Design Thinking Model–Evolution 42. 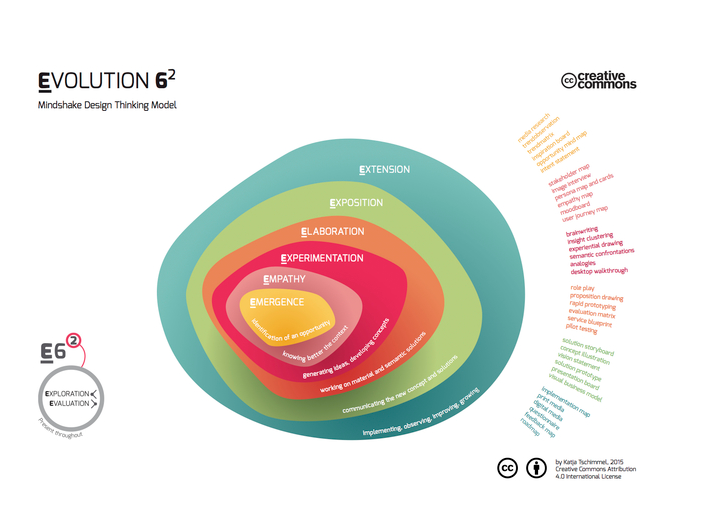 To drive the learning home, we used Evolution 62 (a revision from the Evolution 42). In the first step of the model, Emergence, we used mind map and an intent statement to identify opportunity. Here, the main objective is to go with the flow until you get to a point where you actually see results. The second step, Empathy, is to better know the context; a stakeholder map is done to classify project members (photos or drawn figures are used as description; post-its are used to identify the relationships) and a foto safari – observation is used to identify the ‘as-is’ scenario. To strengthen what we learnt from these photos, we interviewed the relevant stakeholder. This information was then collaged onto an insight board. The third step, the Experimentation stage, was for idea generation and concepts. Using Brainwriting, every idea was posted on the board, with connected ideas clustered using a process called Insight Clustering. These ideas are then modeled using Desktop Walkthrough prototyping. 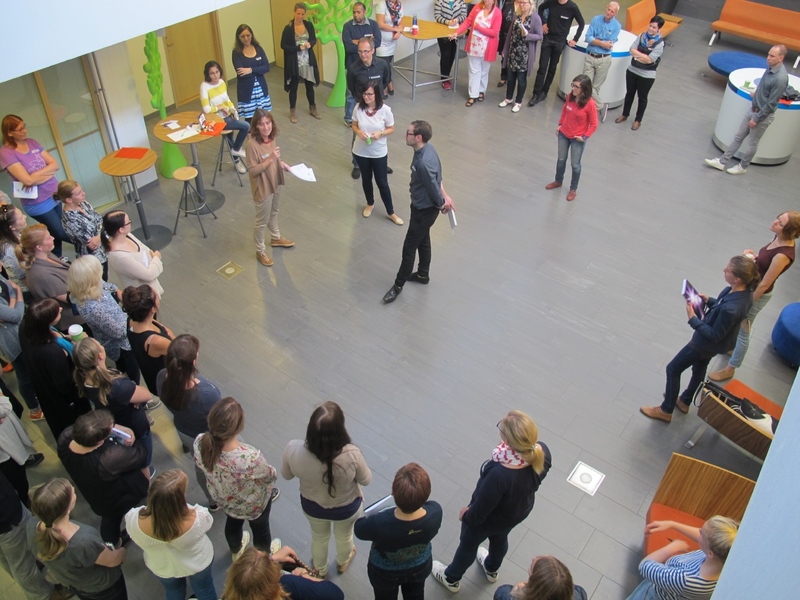 Step four is the Elaboration stage, where we worked on the material and the semantic solutions in order to Pilot Test, via role playing and getting feedback from the audience, the idea. The fifth and final step, the Exposition stage is where we communicated the new solution through storytelling or storyboarding. The insights were subsequently synthesized into a visual framework –a sequence of drawings, symbols, graphic sketches which reflects the user’s perspective. The final process of the Exposition stage is the Visual Business Model for the presentation of a new business idea. In all these stages, the discovery that we actually used our life experiences (work, play, other moments of our life) for a business idea was an eye opener. Katja’s paper “Design Thinking (DT) as an effective Toolkit for Innovation” gave me more depth into understanding design thinking as something tangible and implementable –Katja gives a qualitative analysis of five well-known Design Thinking process models and ten most applied DT tools. Tim Brown’s book targets creative business leaders who seek to infuse design thinking into every level of an organization, product, or service to drive new alternatives for business and society. In this book, Tim Brown talks about the misconception of innovation where most people think that brilliant ideas leap fully formed from the minds of geniuses. The reality is that most innovations come from a process of rigorous examination through which great ideas are identified and developed before being realized as new offerings and capabilities. This book introduces design thinking, the collaborative process by which the designer’s sensibilities and methods are employed to match people’s needs to arrive at a technically feasible and viable business strategy. Put simply, design thinking converts need into demand. It’s a human-centered approach to problem solving that helps people and organizations become more innovative and creative. Design thinking is not just applicable to so-called creative industries or people who work in the design field. Hewlett-Packard used design-thinking to study microfinance in East Africa by re-examining the ways rural communities record their financial transaction despite not having fancy tools and technologies.’ The resulting Universal Remote Transaction Device’ addressed the community’s need for inexpensive, easily-repaired and replaced products..
“Design thinking is a human-centered approach to innovation that draws from the designer’s toolkit to integrate the needs of people, the possibilities of technology, and the requirements for business success.” —Tim Brown, president and CEO.